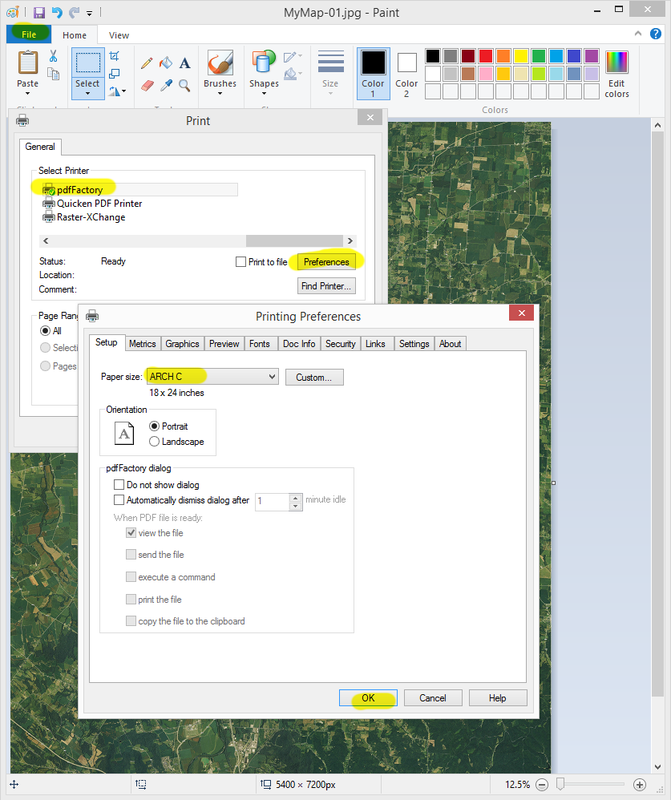 Includes a "work-around" for exporting/printing satellite image map types at sizes larger than 11"x17". TNP includes the ability to split the map image over multiple pages. This allows several pages of a smaller size to be stitched together to form a single, larger page. 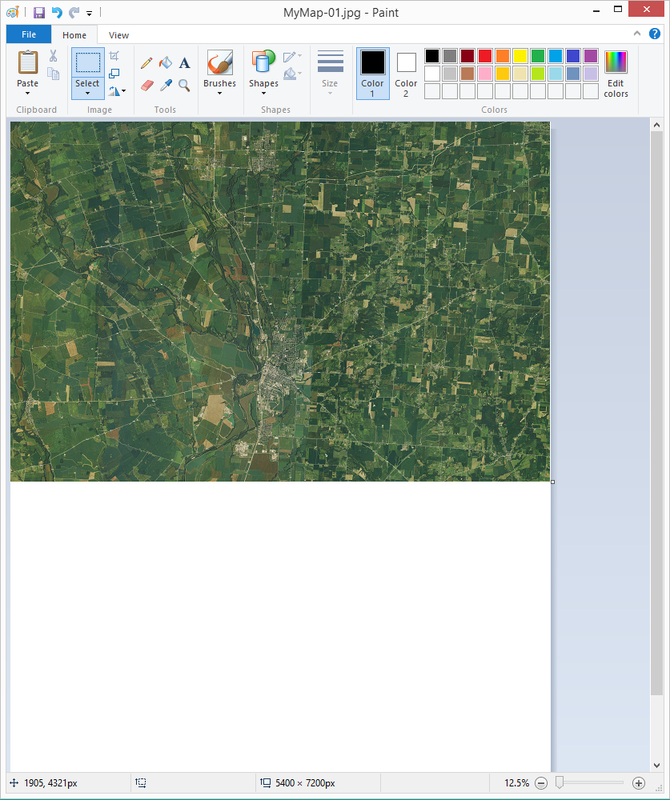 While a bit cumbersome, this can be used to create one large page from several smaller ones - and work within the limits imposed by the map provider. In this example, we will be exporting a 18"x24" map. Use the same steps to export any size needed by substituting the desired dimensions (and pixel computations) throughout. In TNP's Print window, open the Templates tab. Select the template that you want to start with. For example, if you want the map to fill the entire printed page - without any page blocks, gridlines, or margins - choose Map Only and press Load. Open the Pages tab. 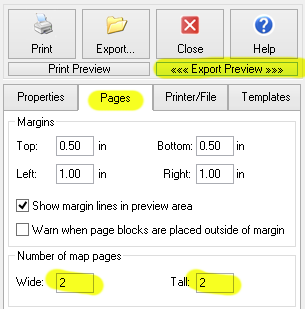 Set the number of map pages to 2 wide and 2 tall. Open the Printer/File tab. Press Export Preview at the top - so that the Preview area on the right now reflects the Exported Image Layout. 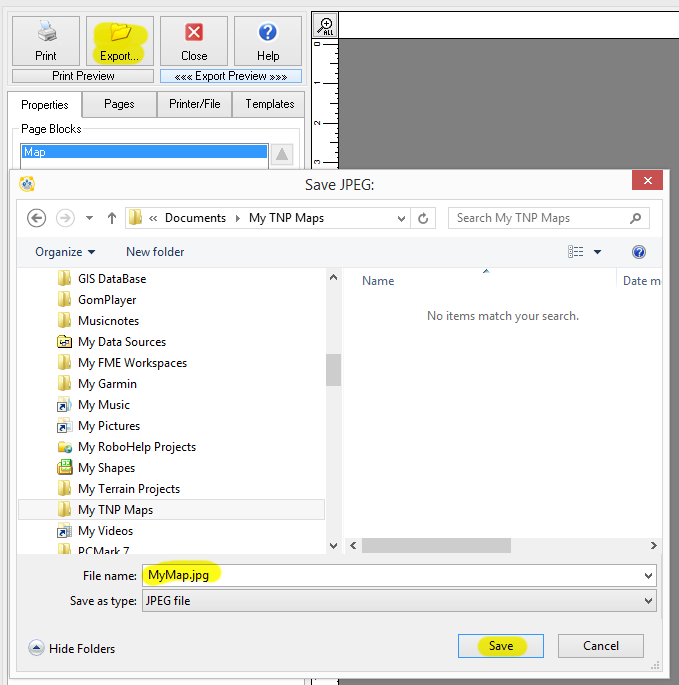 Set the Save as type to JPEG file. In the Dimensions (length) for the Exported Image Layout, set the Width to 9 inches, the Height to 12 inches, and the DPI to 300. 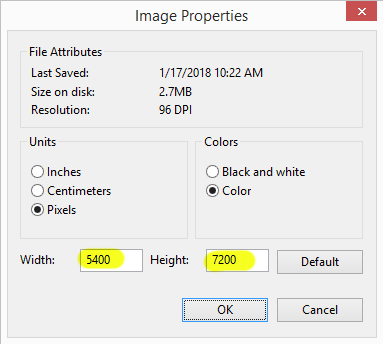 Make a note of the computed dimensions in pixels (2700 x 3600) - we'll need these numbers later. 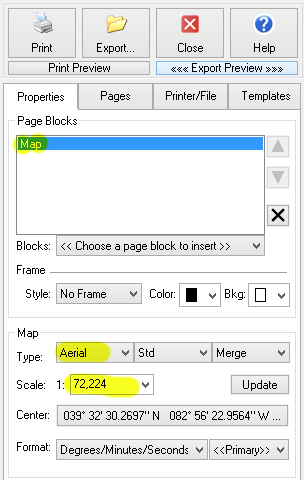 Note: The paper size setting in the Printed Page Layout section does not apply - it refers to the page size used when printing to a physically-attached printer, as opposed to the exported map image we are creating. Once the map type and scale are set, you may want to refine the page blocks further. Optionally, once satisfied, you may want to save everything as a new Template in the Templates tab. Be sure to give it a new name - maybe one that reflects its purpose as a 2x2 map export. This will save some of the above steps in the future. 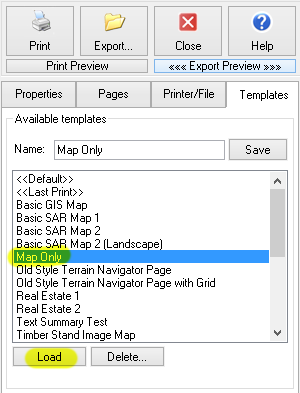 Once the Preview area reflects the map page you desire, press the Export button. Save the map in a location that you will find later. 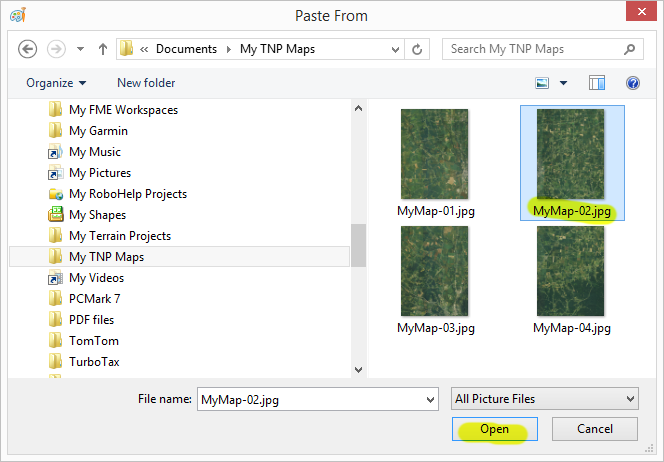 In this example, there is a new folder in Documents called My TNP Maps where the file MyMap.jpg will be saved. Press Save. Be patient as TNP downloads and processes your map data to the highest possible quality. 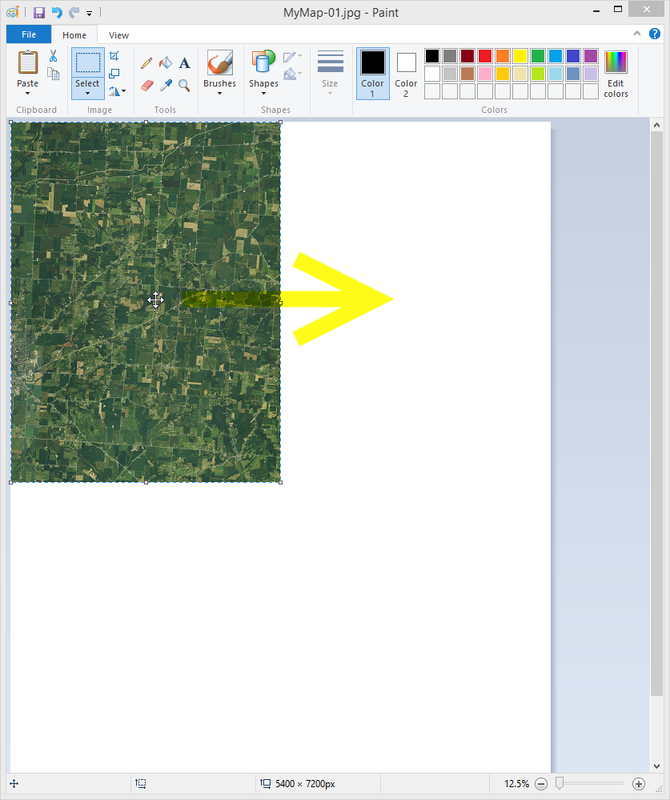 For this example, we'll be using the Microsoft Paint Accessory - since it is standard in Windows. However, any image editing software can be used for these steps. Close or hide Terrain Navigator Pro. 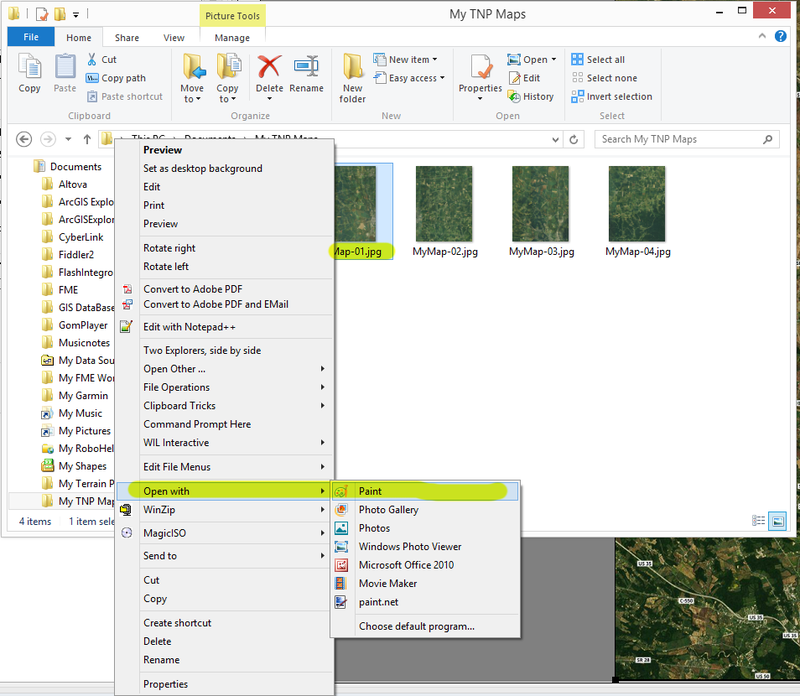 Open the folder where you saved the map image in Step 5. You will now note that you have four individual map .jpg images - one for each quadrant of the map. Right-click on the '-01' quadrant and choose Open with > Paint. 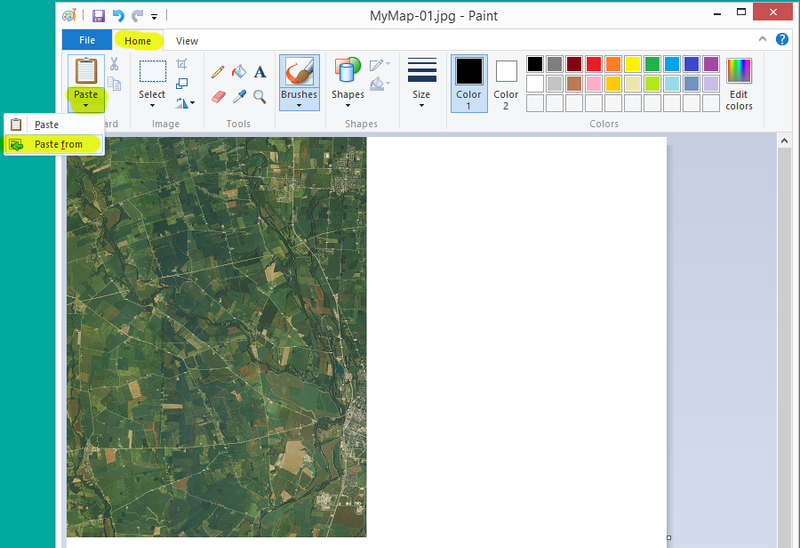 The upper left quadrant of the map will now be open in the Windows Paint accessory. 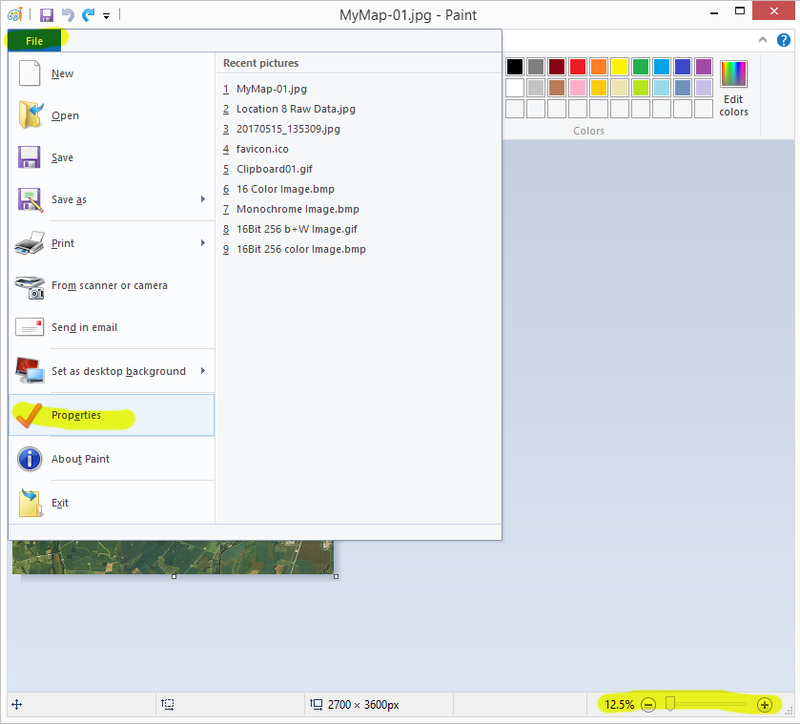 In order to see the whole map, slide the zoom slider in the lower right corner of the Paint accessory to the left. Then click File, Properties. Next, set the finished Width and Height. Since we specified a 2700 x 3600 pixel image in Step 3, we will now be doubling this to Width 5400 and Height 7200 so to create the full sized page. Enter these values, then press OK. The map page should now be the desired size, with blank spaces where the remaining portions are to be added. Back on the Home tab of the Paint accessory, press the down button under the Paste icon and choose Paste from. Repeat this process for the remaining quadrants. "-03" should be placed into the lower left hand corner. "-04" should be placed into the lower right hand corner. Use CTRL-Z (undo) as needed to ensure that each quadrant is placed correctly. In the Paint accessory, press File, then Print, Page Setup. Set the Paper Size to something that will accomodate this image (like ARCH C). Set all the margins to 0 and Fit to 1 x 1 pages (so that the map scale does not change). Press OK. IMPORTANT NOTE: This step assumes that your active printer is a virtual PDF printer that will accomodate a large paper size (or a real printer with this capibilty is attached and is the default printer.) If a different printer is active, skip this step for now, then come back to it before doing the final print. 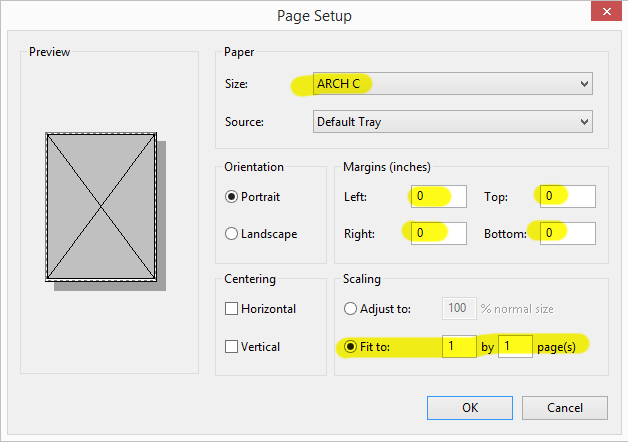 For example, if the desired Paper Size (such as ARCH C) is not currently available, skip this step for now, and select the desired printer/PDF driver that contains that Paper Size in the next step. 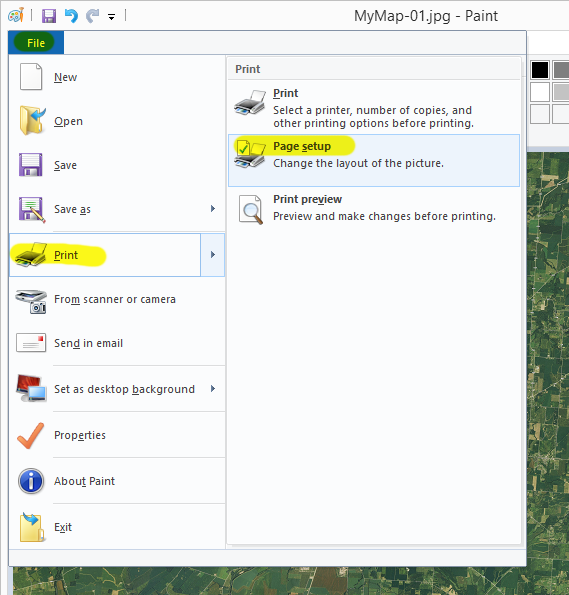 Then press Apply, Cancel, and return back to the Page Setup window to set the Paper Size and Margins. Press File, Print, Print. Select the desired printer (or virtual PDF printer when saving to a PDF file) if it is not set already. (If it wasn't set to the correct pinter/PDF, set it now, press Apply, Cancel, then do the Page Setup in Step 9.) Next, press Preferences. If desired, save this complete JPG map image. Sometimes I get a white map image instead of a regular map when I export the map from TNP. What is wrong? This can occur if the DPI of the finished map exceeds the possible resolution. At extreame scales (such as 1:1,129) there simply aren't enough 'dots' available to produce a high-resolution image. At a scale of 1:1,129, use a DPI of 96. At a scale of 1:2,257, use a DPI of 192. DPI's of 300 can be used starting at a scale of around 1:4,500. 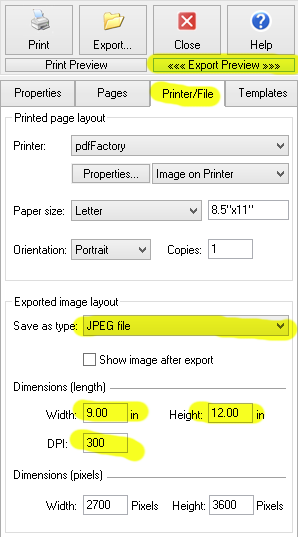 To specify the DPI, open the Printer/File tab, and set the DPI under the Dimensions (length) for the Exported Image Layout.